Spring is right around the corner! I know- I can hardly believe it! It has been SUCH a long winter here in Michigan and we have had way too much snow for my liking. I am so ready to decorate and bring a little Spring indoors! Are you ready to welcome Spring with these awesome DIY projects? I bet you are! Who knew a simple embroidery hoop could be so beautiful? I just love this wreath! I have a few vintage embroidery hoops I’ve collected from yard sales and I need to make some of these seasonal wreaths for my shop space. I love that the faux greenery seems very soft instead of stiff like a lot of fake flowers. Terracotta pots painted a fun color and filled with succulents will cheer up any space! 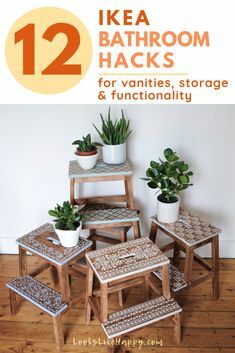 Simple terracotta pots and craft paint applied with a stiff brush and this DIY will be done in just a few minutes! For being so simple, this display is just beautiful! This is such an easy, and inexpensive, way to dress up your mantle, sofa table or console with some lovely Spring blooms. Your garden urns have been waiting all winter to get prettied up for a new season. This idea uses multiple natural elements to create a gorgeous display. Get the look with these Grecian Garden Urns and decorative eggs. These birdhouses on candlestick pedestals are too cute! These would look great in so many places- your mantle, the window sill above your kitchen sink, even the bathroom! Too cute! Get the look with these craft birdhouses and unfinished candlesticks. Not a fan of wreaths? Then this is an awesome alternative for you! Too sweet. It’s hard to believe these are paper flowers! Get the DIY tutorial from Poppytalk here. These reversible block letter signs are great! These are on Etsy, but they are definitely a DIY – possibly with leftover wood scraps you already have. You can paint them any color to match existing decor. Learn how to make a pretty cotton stem branch with this DIY tutorial from ehow.com. Put it in a pretty Spring vase and you have a great centerpiece or addition to your mantle. Kristen at Yellow Bliss Road is so talented! She designed this beautiful printable and is offering it free on her site. Finally, this adorable “eat your veggies” iron on by Oh Happy Day is too cute! Iron it on a tote you can use to bring in your garden grown veggies! What do you think? I am anxious to get started! Ready for more Spring posts? Be sure to read these posts, and also posts for all seasons in the Holiday section of LLH! For more Spring decor ideas, check out our Spring & Easter board on Pinterest, and also our DIY for the Home – Furniture and Decor and Craft and Create boards on Pinterest, for hundreds of great ideas from other awesome bloggers!